Keywords are words or phrases that are matched to the things people are searching for, ultimately triggering an ad to show in the SERPs. Keywords are arguably the most intrinsic part of any Search campaign, they are what will trigger or not trigger your ads. Keywords sit within ad groups along with ads… It is the keywords in an ad group that will trigger the ads in the same ad group. Thus, there arises an obvious need to keep these components closely knit to maximise on their relevance to each other. We have already described briefly what keywords are, but we refer to a n umber of similar things within this guide, such as Search Terms / Search Queries. Keywords are terms that you define and upload to your AdWords account; whereas ‘Search Terms’ or ‘Search Queries’ are the actual words that the user has searched for in Google to trigger one of your ads. Hence ‘keywords’ and ‘search terms’ have the potential in many cases to be different combinations of words from one another. Keywords should be determined through the process of keyword research, simply adding terms that are seemingly relevant to your account is less than ideal. AdWords is a very data heavy system and that data is abundant in pretty much every area you could imagine. Consequently, all of your decisions should be driven by data. We discuss keyword research and Google’s Keyword Tool in another article. This is where you enter the keyword you want to target, this can be anything; literally anything you can think of! Well, Google do have guidelines and we cover these below. We mentioned earlier that keywords need to be identified through research, which we discuss in more detail in another article. Keyword match types are pretty simple but can take a little while to get your head around. Arising from the need to match a keyword (what you are targeting) to a search term (what the user is searching for). Each match type (when implemented properly) moves sliders along two spectrums; exposure and relevance. Exposure is the volume of potential impressions and clicks that a keyword could get and relevance refers to how relevant that audience is likely to be to that keyword. All match types essentially have an inverse relationship with these two characteristics, which we detail below for each match type. This is the narrowest way to target users, limiting your ads to show in the least number of instances, typically making search terms very relevant to your ads. Consequently, you do not need to use negative keywords in ad groups with only exact match keywords. Thus, this strikes a great balance between exposure and relevance. The Maximum CPC (Max. CPC) is the maximum you will be charged for a Click (on average) when one of the keywords triggers an ad. The Max. CPC is the base figure and onto it are applied any adjustments that you may have in the account such as mobile bid adjustments or ad scheduling bid modifiers. When set at keyword level, this bid overrides the default ad group CPC bid, taking precedent over it. So, if you have bids set at both the ad group and keyword level, AdWords will use the keyword Max CPC. For more information on bidding strategies please follow the link. 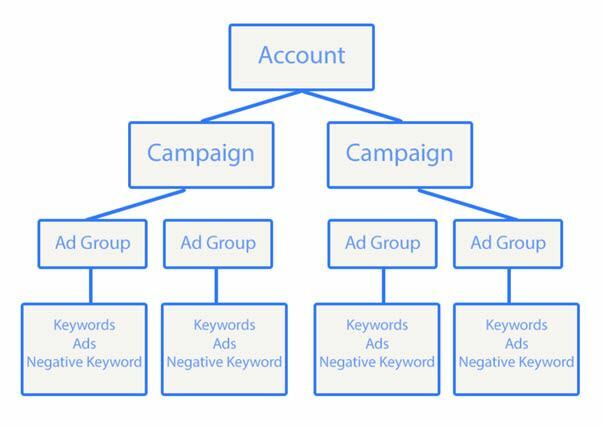 Properties flow down from Campaign to ad group level to keyword level, so a paused campaign or ad group can have will not allow any keywords to trigger ads regardless of the status of the keyword. Keywords that are ‘enabled’ are essentially live Keywords. Removed Keywords are Keywords that have been deleted; they still appear in the account but are greyed out. The default here is actual called <default> which defers to the bidding determined at the ad group level. The other pre-existing option is ‘Manual CPC’, which doesn’t need to be set unless that keyword is being managed differently that the rest of the keywords in the ad group. All other bid strategies are things that you will need to have created yourself, in advance in the online version of AdWords. You can learn more about bidding strategies by following the link. Bid strategies can be applied to ad groups, campaigns, and keywords but precedent is taken from the lowest level where a setting exists. Bear in mind that it is more commonplace to set this within the ad rather than the keyword. If your ad groups are structured properly you should not need to specify unique URLs for each keyword in the ad group. Keyword level Final URLs override Final URLs set at ad level. The Final Mobile URL is where you can specify a different landing page for visitors that are using a mobile device. Thus you can have two Final URLs for a keyword. If the Final Mobile URL is not used, then the Final URL is used as the default. The rules for this are the same as the above rules for Final URLs. Keyword level Final Mobile URLs override Final URLs set at ad level. For the same reasons described above, it is recommended that your ad groups are structured such that you do not need to specify the Final Mobile URL at keyword level. QS is an estimate of the quality of your keyword, ads and landing page. Improving the QS can lead to lower prices and better ad positions. We mention this because the QS (Quality Score) is an attribute of the keyword and when viewed, you must look at a keyword report to find it. QS is also one of the most important metrics in the entire AdWords account. We say this because in it determines how much you will pay for a click in each position an ad can appear in. This is calculated in conjunction with your Max. CPC, but if a QS is too low, your Max CPC will need to be higher in order for ads to appear on the front page. We cover Quality Score in more detail in another guide, which you can read by following the link. For now it is worth noting that the Quality Score can be improved through account structure, keyword research and landing page optimisation. The above ‘status’ specifically refers to the parameter that you can define within AdWords. This however refers to the status attributed to a keyword by Google / AdWords. Keywords that are eligible, have no problems and are working as intended. If the QS is too low, a keyword will often not show at all. Google have deemed the overall relevance and quality to be too low for their users. Some keywords simply have very low search volume and consequently get little traffic. This is a ‘soft’ warning as keywords can be left in the account in this state with little impact if for good reasons. Some keywords are seasonal and will consequently not be relevant all year round for example. This is another ‘soft’ warning and one that can come with mixed signals. Keywords that have a bid set too low will not appear on the front page of Google. But this is an average and often keywords will be appearing on the front page some of the time. Either way, exposure will be limited with keywords seeing this status. Disapproved keywords will not trigger ads and need to be addressed to avoid potential escalation, depending on the volume of them present. See the guidelines section below to understand why keywords might be disapproved. This refers to keywords that are not eligible to run due to the user set ‘status’ or the keyword, campaign or ad group described earlier in this article. If the keyword is paused or removed it is not eligible to trigger ads. If the campaign or ad group containing the keyword is paused or removed it will prevent the keyword from triggering ads. Campaigns can have a start and end date set, if the campaign is outside of this specified date range, the keywords will not trigger ads. We have discussed the various components, behaviours and attributes of keywords within this article, but we also want to cover briefly the mechanism or system that facilitates keywords to trigger ads on the search network. When a person searches in Google an auction is run, that determines what ads are shown and in what position. QS is calculated as keywords are evaluated and combined with your bid (CPC or otherwise) to determine the outcome of the auction. The outcome of the auction is the final result... The ad position, the cost per click, for each ad that appears. Thus Google is balancing relevance and Quality and Bids in order to deliver the final results. Keywords are selected based on their relevance to your products and services and trigger ads to show to people when they are searching for your keywords or similar variations of them. Allowing you to target people with ads relevant to what they are actively looking for at that moment. This refers to the promotion of mobile apps and relates to the searches and ways used by people to find those apps. Here keywords are used to find related content on other websites, next to which your ads appear. In this instance your keywords are related to the content the user is engaging with rather than the searches the user performed. Google has a lot of guidelines and policies, we have highlighted those here that are relevant to keywords but have a more comprehensive guide to Google AdWords Policies. For some years now, depending on what region of the world you live in, it has been possible to bid on Trademarked terms, such as company brand names. Hence it is completely legitimate to add keywords to an account that bid on trademarked terms. You cannot however, use the trademarked term within the ad copy, making these keywords typically have very low-Quality Scores. For more information on Google policies please follow the link. As a footnote to this guide we felt it important to mention ‘relevance’ due to its importance in QS. Keywords in an account should all be relevant, or as relevant as possible to the website and specifically the landing pages they deliver traffic to. Keeping keywords in small groups of closely related terms within an ad group enables you to maintain relevance between the keywords and the ads. This also afford you the ability to have more specific landing pages, relevant to all keywords in the ad group. Click Through Rate is a strong indication of the relevance an ad has to the search terms that trigger it. No metric in isolation has much meaning, but once a baseline or an average for a set of keywords has been established, taking into account things like average position and network, CTR is a very strong indicator of relevance. CTR directly effects QS and so it is vital to have this be as high as possible for the position the ad appears in. If you track conversions and the aim of the traffic is to convert it, conversion rates below average could indicate a low relevance between the search term and the landing page. Metrics such as average time on page, bounce rates, etc when below average, are also where relevant to the goals, are good examples of irrelevant keywords or search terms, ads or landing page.